If you're looking for information on the 2018 Digital Immersion Project, please click here. It’s a new year, and with it comes the urge to set new goals and objectives, buoyed by the promise of new possibilities. In the spirit of harnessing those ambitions, PBS Digital is excited to announce a new professional development opportunity for stations and their digital professionals aimed at improving local efforts across platforms. The Digital Immersion Project, developed by PBS Digital with support from the Corporation for Public Broadcasting, is a unique opportunity that mixes in-depth training, hands-on workshops, and collaborative mentorship to improve overall expertise in digital strategies and tactics. 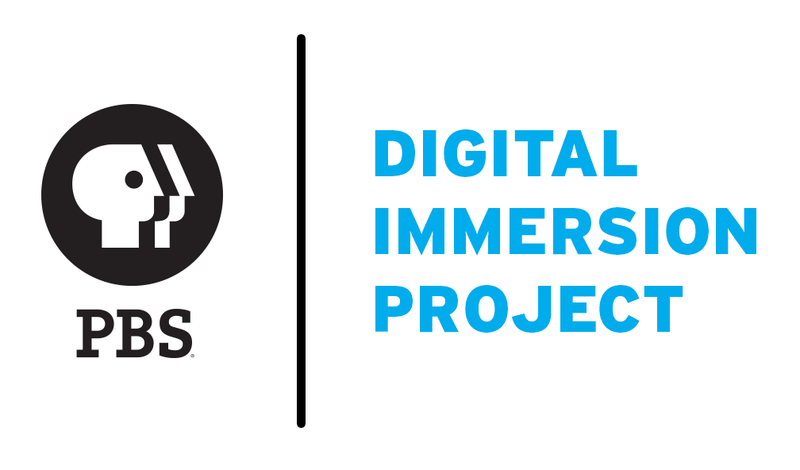 Twenty-five (25) digital professionals from PBS member stations will be selected to become Digital Immersion Partners. The professional development program also focuses on strategic and organizational tactics, with the selected participants being able to draw on the project’s learnings and a national network of public media contacts to further digital success at the local level. Follow the link below to apply, or keep reading for more details. After an initial onboarding, meet and greet, and assessments, the core in-person training week of the project begins with participants sponsored to attend PBS TechCon 2017 from April 19-21. In addition to general conference activities, Digital Immersion Partners will attend a specially curated program of workshops, sessions, and events, that will lead into post-conference follow-up and goal setting. For more specifics on activities and schedule, check out the first page of the application. Following the initial immersion training experience, participants will work with each other and mentors for an additional six months to not only gain knowledge, but also achieve a uniquely set goal that is specific to their station. Upon completion, each participant will also have completed a Digital Strategy exercise that takes the project’s learnings and maps them to the station’s goals, complete with tactics and deliverables. The primary requisite for applicants will be a responsibility for digital strategy or execution at a PBS Member Station, which can be either direct or a part of a larger set of job duties. Recipients will be selected from with a wide-range of skillsets and experience in public media. Ideal applicants have demonstrated leadership in their field of expertise and a commitment to strengthening public media’s reach across platforms to communities around the country. Since the project emphasizes ongoing learning, applicants should articulate how they would use this digital training to improve their station’s overall digital efforts. A letter of support from a supervisor or GM is also required for the application. Recipients will be required to participate in all activities detailed in the application introduction, available here. The Digital Immersion Project application deadline is February 28th, 2017, with recipients being announced in March. Our goal for the Digital Immersion Project is to work with individuals from stations of all size and license types. Applications will be reviewed by a multi-discipline group of colleagues from PBS and the Digital Media Advisory Council (DMAC), a representative body of station leaders focused on advocating for station digital needs. PBS Digital is excited to offer this unique opportunity to stations and their digital professionals with CPB’s support. We hope the talented professional across the system join us in further developing our industry's multi-platform capabilities. If you have any questions, feel free to reach out to PBS Digital at spi@pbs.org. What: An immersive professional development opportunity developed by PBS Digital, with support from the Corporation for Public Broadcasting, that mixes in-depth training, hands-on workshops, and collaborative mentorship to improve overall expertise in digital strategies and tactics. Participants will attend PBS TechCon 2017 for an in-person training week, followed by six months working with each other and mentors to gain not only knowledge, but also achieve a uniquely set goal that is specific to their station.